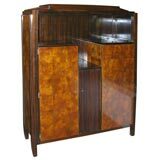 Art Deco streamline cabinet designed by Walter Dorwin Teague for Hastings. 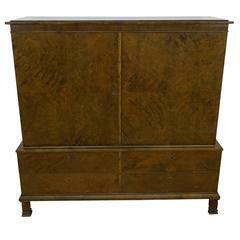 Originally a server for a dining suite but perfect as a bar cabinet or storage. Newly refinished, polished and painted. Along with Raymond Loewy, Norman Bel Geddes, Henry Dreyfuss and others, Walter Dorwin Teague pioneered the field of industrial design in the early decades of the 20th century. In his designs for furniture and objects that ranged from table lamps to radios, Teague helped defined the Machine Age aesthetic — the streamlined style that was the American counterpart to the French Art Deco movement. Teague grew up in rural Indiana, the son of a Methodist minister who was also a tailor. The young Teague was skilled at drawing, and in 1903, after finishing high school, he saved some money and moved to New York, where he took classes at the Art Students League. He later found success as a typographer and an advertisement illustrator. The look of ads in the early 20th century was so far superior to that of the actual products being promoted that manufacturers began consulting with illustrators like Teague about the styling of their goods. Teague’s aesthetic sensibilities were strongly shaped by a trip he had made to Europe in 1926, when he toured the Universal Exposition in Paris, buildings by Le Corbusier and a Bauhaus exhibition. On his return home, Teague founded an industrial-design consultancy. The following year, he won his first big client, Kodak, for whom he designed cameras, such as the famed Bantam Special, with its sleek, “speed line” detailing. His firm would go on to design such things as pavilions for the 1939 New York World’s Fair, rail coaches, gas stations, automobiles, corporate logos and a Boeing airliner. Among collectors, Teague’s products designs are prized not so much for what they do as for what they represent: a moment when design took a hand in fostering a spirit of energy, optimism and progress. Objects such as his Kodak 1A Gift camera, with its Constructivist case and box, have a graphic punch that should find a place in many a vitrine. His 1930s glassware lines for Steuben still make a striking presence on the bar or the dinner table. The jewels among Teague collectibles are his 1939 Bakelite-shade table lamp for Polaroid (made before the firm began producing cameras) and his striking designs for the Sparton Radio Corporation, most notably the rare and stunning Bluebird model, with its circular glass and chrome frame. Prices for Teague’s work vary widely by medium, style and condition. But as you can see from these pages, the designs of Walter Dorwin Teague are emblems of both a time and a distinctive style. They are cynosures for any true collector. 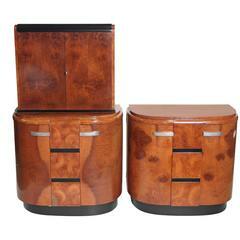 Svend Langkilde design rosewood two-door cabinet with a fitted interior comprising drawers and adjustable shelves. In very good original condition. 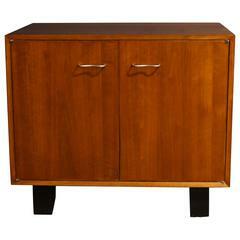 Peter Hvidt & Orla Molgaard Nielsen teak cabinet made from solid teak with a tambour door. High quality construction and design details, stamped. Walter Dorwin Teague, Royal Metal Co.
A French Art Deco cabinet by Andre Sornay (1902-2000,) circa 1920-1925, in ebony Macassar and oak, with walnut root marquetry.